Beverly Williams and Sheryl Walton took turns responding to questions submitted by community members during the D7 candidate forum late last month. Photo: Howard Dyckoff, Oakland Voices 2012. A mixed crowd of about 100 attended the District 7 Candidate Forum on August 22nd. 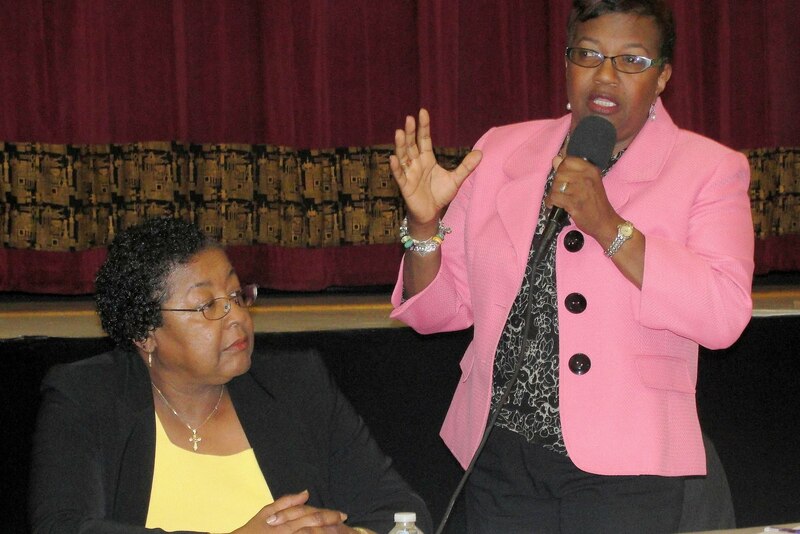 In a friendly exchange of views, the 2 challengers, Beverly Williams and Sheryl Walton, discussed the major problems of Deep East Oakland and their ideas for improving conditions in the City Council district. Four-term incumbent Larry Reid, who had been slow in committing to the forum, did not attend due to a sudden medical emergency. At this time, the councilman’s health status has not been confirmed. Reid also did not respond to a request for answers to questions based on those asked at the forum. This is the only community event to date for D7 candidates. It was hosted by Allen Temple and co-sponsored by Oakland Community Organizatons (OCO), the NAACP, Bock by Block Organizing Network (BBBON) and the League of Women Voters. The Chamber of Commerce had planned another candidate forum for September 4th, which was cancelled. Without Larry Reid attending, there was less opportunity for debate. The challengers explained their approaches to key issues and were cordial and complimentary to each other, frequently sharing agreement while occasionally promoting themselves as candidates. Both challengers have long histories in the communities of East Oakland and have worked together on projects in the past. Last year, they collaborated on a successful District 7 Town Hall, sponsored by the Mayor’s office and several community groups. I was the principal photographer for the event. Here is a slideshow from that 2011 Town Hall. Theresa Nelson of the League of Women Voters introduced the candidates, and several of the sponsors asked prepared questions. Rev. Buford of Allen Temple, which hosted the candidate forum,.asked about community-police relations and the Goldman Sachs credit rate swap that is now costing Oakland over $1 million a year. The City of Oakland entered into an agreement 5 years ago to borrow funds from Goldman Sachs at a fixed rate of 5.6 percent when the city needed to retire some municipal bonds. It was a good deal at the time. Since the prime rate has been near zero for many years, this agreement, which had been a boon to Oakland and other cities across the nation, has become an expensive burden. But Oakland would face a $17 million penalty if it tried to terminate the agreement early. Sheryl Walton spoke at the D7 community candidate forum. Photo: Howard Dyckoff, Oakland Voices 2012. Beverly Williams said the OPD needed a change in its structure and said the city administration should “work ferverently to end” the rate swap agreement. Audience members also asked about dumping and unoccupied foreclosed properties, building up small businesses in District 7, public safety, and creating jobs and opportunity for youth. Both challengers want to see violent and property crimes reduced and an improved climate for small businesses in District 7. Both also want to reduce foreclosures in the district. 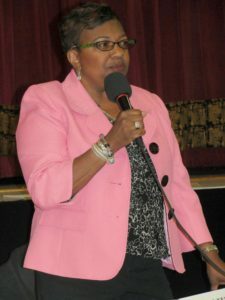 Candidate Sheryl Walton spoke about the missing Business Improvement Districts, which use resources from the city and the local business to solve community problems. Walton said they are especially needed on International and MacArthur Blvds. “We need to encourage businesses to form associations and also will make them to be aware of facade improvement and other programs from the City of Oakland,” Walton said. Williams also told the audience about her work with the Alliance of Californians for Community Empowerment (ACCE) in preventing foreclosures and in getting the banks to maintain vacant properties that they own. With ACCE, she helped establish the Vacancy Resident Property Ordinance. This was passed on a first reading, but the City Council delayed the 2nd reading and diluted the ordinance. Working with many community groups, ACCE got it back on City Council agenda in 2011 and worked to get it finally approved in its stronger original form. To date, this has raised $1.6 million in fines to use for community improvements and enforcement of the ordinance. Walton spoke about economic justice with regard to foreclosures. She suggested creating a community land trust led by local non-profit organizations. The trust would buy up and hold foreclosed properties. Walton is also interested in using the Boston model where the city works on deals with the owning banks to buy and then resell the property back to the prior owners. One of the best questions was the last one: what plan do you have to ensure city’s commitment to restorative justice and reintegration of people from prison back into the community? Walton said she was “definitely on board with that. That is how we used the time bank project in Sobrante Park to help offenders” with their transition back into the community. The Time Bank in Sobante Park allows community members to perform work for others. They are then paid not with cash but by receiving services they need from others in their community. This helps with re-integration and allows ex-offenders to get services like resume writing that they couldn’t otherwise afford. Beverly Williams spoke at the D7 community candidate forum late last month. Photo: Howard Dyckoff, Oakland Voices 2012. Williams said restorative justice is important and we need to have resources available to prepare offenders for re-entry. But the community, she explained, also needs to be prepared to be involved. She added that former drug users should not be allowed to fall back into a life of crime. Both candidates have vested interests in seeing the district prosper. Sheryl Walton has lived in East Oakland for more than 40 years. Beverly Williams moved to the area in the 70s. They have each raised children in District 7. Walton has a history working as a community organizer to improve the health and well-being of neighborhoods for more than 30 years. This includes being chair of the City of Oakland’s Central City East Project Area Committee, formed because residents wanted improvements to the MacArthur Boulevard Corridor. She also worked for the Alameda County Social services Agency and also as staff on the City-County Neighbohood Initiative project for Sobrante Park. Her work in Sobrante Park helped secure a $3 million grant for the Madison School OUSD-community health clinic. 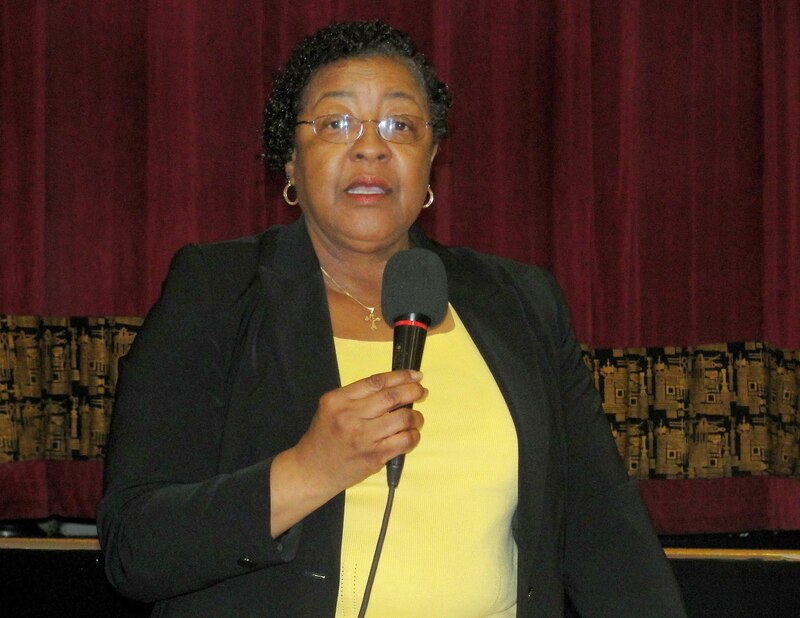 Williams is co-chair of her local Neighborhood Crime Prevention Council, and Commissioner Vice-Chair on the Oakland Rent Board. She has worked with many community groups, including ACCE, OCO, and Urban Habitat. Hopefully, after the November election, one of the D7 City Council candidates can begin to reverse the the long slide experienced by neighborhoods in Deep East. Click here for a photo album from the D7 candidate forum.